Hormel Foods Corporation (NYSE: HRL), a multinational marketer of consumer-branded meat and food products, today said it expects its third quarter earnings to be $.37 – $.39 per share, compared with $.41 per share in the third quarter last year. “In the fourth quarter, we expect to see continued earnings pressure at Jennie-O Turkey Store from higher input costs, as the birds fed with higher grain prices make their way through the system. We are adjusting our full year guidance to $2.22 – $2.28 per share, which is above our results of $2.17 per share last year ($2.14 excluding the sale of assets in the fourth quarter of 2007). Our previous guidance was $2.30 – $ 2.40 per share. We will provide more details regarding the quarter and outlook during our conference call on August 21, 2008 at 9:00 a.m. CT,” Ettinger concluded. Hormel Foods Reports Third Quarter Results Hormel Foods Corporation (NYSE: HRL) today reported its performance for the fiscal 2008 third quarter. Hormel Foods Reports Second Quarter Results Hormel Foods Corporation (NYSE: HRL) today reported its performance for the fiscal 2008 second quarter. Hormel Foods Corporation, based in Austin, Minn., is a multinational manufacturer and marketer of consumer-branded food and meat products, many of which are among the best known and trusted in the food industry. The company leverages its extensive expertise, innovation and high competencies in pork and turkey processing and marketing to bring quality, value-added brands to the global marketplace. 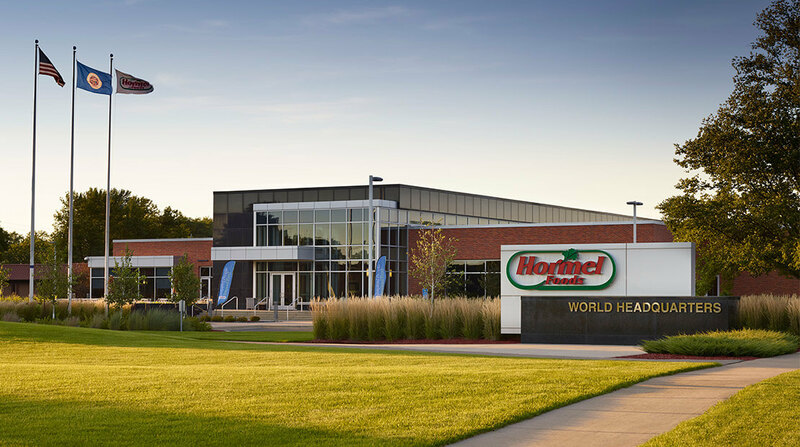 For each of the past nine years, Hormel Foods has been named one of “The Best Big Companies in America” by Forbes magazine. The company enjoys a strong reputation among consumers, retail grocers, foodservice and industrial customers for products highly regarded for quality, taste, nutrition, convenience and value. For more information, visit www.hormelfoods.com. This news release contains forward-looking information based on management’s current views and assumptions. Actual events may differ materially. Please refer to the cautionary statement regarding Forward-Looking Statements and Risk Factors that appear on pages 25-30 in the company’s Form 10-Q for the quarter ended April 27, 2008, which can be accessed at www.hormelfoods.com under “Investors-SEC Filings.